Happy Pumpkin was another Fiesta design offered through the Betty Crocker catalog. I have only two pieces, this salt and pepper set. They pair perfectly with the Fiesta Halloween Jumbo Chili bowl. 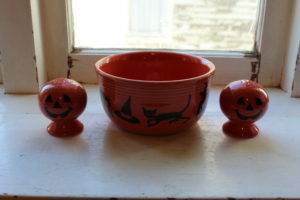 Fiesta Happy Pumpkin salt and pepper shakers and Fiesta Halloween jumbo chili bowl-perfect for the season!